THIS WEEK’s “Ask the Experts” question comes from yours truly. One of the great parts of this job is that I have access to the best minds in the business, from world-class anglers to famous historians. Paul Schullery, author of the seminal American Fly Fishing: A History and former director of the American Museum of Fly Fishing, is one of my favorite correspondents. Despite the wealth and breadth of his knowledge, he’s always excited to explore what he doesn’t know, and he takes great pleasure in trying to untangle fly fishing’s incredibly complex and confusing history. 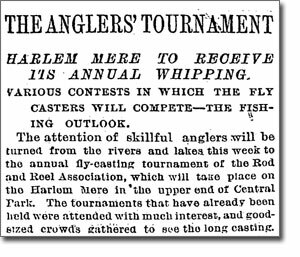 I was mucking about in the Google News Archives (which I am wont to do), when I chanced across this here 1888 New York Times story about a casting competition on the Harlem Mere in Central Park. I figured if anyone would know what this was all about, it would be you. Are you familiar with this old use of “switch”? Didn’t mean to be slow, but your message started a little exchange between me and two of my fishing-historian pen pals, Andrew Herd and Ken Cameron. What follows may be views of any or all of us, or not. You’re right, nothing is new, or at least nothing is as new as we think. But that’s part of what makes this question so interesting. Picture an expert fly fisher, say in the sixteenth century. He has a fourteen-foot rod, and a tapered horse-hair line that is anywhere from the same length to maybe twice as long. He’s been fishing with this rig for thirty years, and because he’s a reasonably thoughtful and intuitive outdoorsman he can make it do things that amaze the beginners. He can lift that line and turn it and roll it and drape it over brush and swing it out of harm’s way right before the fly hooks something undesirable. He can keep almost all of it off the water to dap, he can sneak it under a hostile breeze, he can hang it up in that same breeze on purpose, to go the other way. It stayed this way, as far as learning to cast, until the early 1800s. The books published from the fifteenth to the early nineteenth century say almost nothing about the specific techniques of presenting the fly. Because they said so little about their techniques in print, and because we like to think of ourselves as smarter than our ancestors, we tend to view these guys as simply dappers or down-stream swingers. But why would they be? They had the same native intelligence we do today; why wouldn’t the savvier ones, at least, develop the skills to get every ounce of versatility out of their tackle? You or I would. Well, you would, anyway. What this means, I think, is that something like the roll cast, or switch cast, or any number of other casts that we now recognize by name, were probably being invented again and again, and were probably in common use to whatever extent the tackle of the time permitted. What happened in the early 1800s, among other things, was that more and more (increasingly urban) people learned to fish from less direct sources. The publishing and printing revolution of that century enabled a huge increase in the number of books on every subject, and a greater and greater specialization among the books. More and more people needed to know the basics of fly casting, for one thing. So all those loosely practiced techniques that you might (or might not) have seen on the stream for many centuries finally got written down; especially, they got named. Besides, once people starting writing more of these details down, they wanted to get credit for them. Some of these guys may even have invented some of this stuff again and not even known it had been around for centuries (see Pritchard, below). So that’s the challenge of discussing the origins of something like the switch cast. Francis Francis, in A Book on Angling (starting in 1867, this was a standard reference work for a long time), described the switch (I don’t think he actually used the term “switch cast,” just “switch”) as used when you had no room behind you and had to put the fly someplace else. A complication is that it’s not always clear in these early accounts just what the fisherman thought he was “switching.” He certainly was switching direction; at least he was probably trying to take a line that had drifted all the way downstream and put it back up into the water he wanted to fish. But Ken has wondered to what extent was this meaning combined with another, that of the “switch,” an old term for a fine stick or whip? It wouldn’t be much of a coincidence for anglers to have imagined themselves handling a switch in the sense of a limber stick as they whipped their rod around in the switch cast. By the way, Ken has also wondered, though asserting that he has no evidence to prove it, if the use of the term “switch” to describe this cast may have originated from the early-nineteenth-century popularizing of the term “switch” in railroading. The engine switched tracks, the fly caster switched directions. Who knows if this is how it happened that we started calling it the switch cast, but it’s an interesting idea; using “switch” to mean “change” seems to have first gotten common in the railroad era, I think. This question also shows the looseness of a lot of angling terminology, which both Ken and Andrew (me too, for that matter) note as a common problem in figuring out what some of these guys meant as these terms were appearing. This is most evident in the many different flies that had the same name. Cliff Netherton’s big book, History of the Sport of Casting, People, Events, Records, Tackle, and Literature, Early Times (1981) would be a good place to troll for more details, but his index is only proper names, so you really do have to troll. I notice he has the program from an 1898 casting competition in New York that has a competition for the “Switch or Pritchard Style.” Someone probably knows all about Pritchard, whoever he was, and I suppose someone (maybe Pritchard himself) thought he invented it. It’s interesting that in this 1898 competition “An obstacle, 12 feet high, will be placed 15 feet back of the contestants.” This differs from the rules in the competition you found. I also notice (on page 108 of Cliff’s book) that Hiram Hawes, one of the big names in casting in that era, made a “switch” cast in New York in 1887 of 102 feet. Makes me wish I could see what he did, just to be sure that was the same definition. He was using an 11-foot rod. Not bad. Amazing, in fact. And, in fact (Aha! ), the second-place finisher (page 101) in what may have been the same tournament was “Harry Prichard.” Different spelling, but I bet it’s the guy. And, looking in Cliff’s index, I find that the Pritchards (Harry had a brother) are all over the book. Here’s the part that matters, page 368. HARRY PRITCHARD (1827-1888) of New York City began casting in America in 1881 at Brighton Beach, Coney Island, New York. He finished third, second, and first, casting 91 feet, 74 feet, and 76 feet, and introduced Roll Casting. In 1882 on Harlem Mere, Central park, N.Y., Harry Pritchard used the Roll Cast and won the Class C Open Distance Fly Event with a cast of 91 feet. Roll Casting became a regular event after 1882. In 1885 he cast Trout Fly 91 feet. In 1887 he cast Salmon Fly 113 feet. It goes on from there. I begin to remember having seen the name before. Cliff says he created the Beaverkill wet fly, and was a tackle dealer, so I must have seen it but have blessedly jettisoned it along with many other obscure details that used to seem worth remembering. None of this may really answer your question about when switch rods appeared. That would take a really thorough and incredibly unappealing search through hundreds of old catalogs, especially now that we know the term goes back at least to the 1860s, even if the technique was unnamed in use long before that. I don’t know why I got so involved in this and wrote such a long note on it. Maybe I secretly miss writing about fly fishing! Anyway, I hope it’s not too late and is helpful.